The Buffalo Sabres could be receiving some very late season scoring help on the wing. Sabres’ top forward prospect Hudson Fasching could be in blue and gold in the next few days to weeks. The college season ended today for Fasching and the University of Minnesota. The Gophers were defeated by Michigan in the Big Ten title game. The Sabres will look to quickly begin negotiations with Fasching according to a report in the Buffalo News and get him in Buffalo for a few games. Fasching was acquired by the Sabres in one of General Manager Tim Murray’s first moves. Fasching was part of a trade where Buffalo acquired him and Nic Deslauriers from the Los Angeles Kings for defenseman Brayden McNabb and two 2nd round picks. 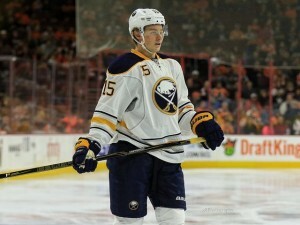 The 20-year-old winger has been a player Sabres fans have kept their eyes on at the NCAA level for a few years. His size at 6’3 around 200 pounds, has always made Fasching an intriguing prospect. He’s the prototypical power forward. He works hard in the corners, goes to the dirty areas on the ice and is a good skater for his big frame. This season at Minnesota, Fasching, took his game to the next level and became a leader for the Gophers. In 37 games this season Fasching recorded 20 goals and 38 total points. He’s played big minutes for the Gophers this season including both power play and short handed minutes. The Junior has scored some big goals for Minnesota as well including a big goal a few weeks ago over Michigan to put the Gophers in first place in the Big Ten for the time being. Like most young players, consistency has been the issue for Fasching. He has all the talent, but at times will disappear. This season as I’ve mentioned was different for the Minnesota native. He brought his ‘A’ game consistently and that may have come with maturity. young players who have the drive to be successful. In particular Jack Eichel and Sam Reinhart. The big winger seems like a good fit to be a running mate with Eichel and Reinhart. He has all the tools necessary to keep up with that pair and his big body should be to create more room on the ice. I don’t expect Fasching to immediately be placed with those two top forwards, but it’s something I’d like to see prior to the season ending. It’ll give the organization an idea if that is something that could work in the future. Fasching may not be NHL ready yet, but he’ll get the opportunity if he signs with the Sabres. I imagine as part of the agreement he’ll be guaranteed to remain on the Sabres roster for the final few games of the season. Fasching’s arrival will make the remaining games interesting for fans and give another glimpse into what the future may hold for the Sabres.